I'd like to do some depth-of-field tests for my dslr film scanner project. It should help us narrow down the choices in negative positioning systems. they say that a 1x mitutoyo objective has a depth of focus of 306 μm, and a 2x has a depth of focus of 91 μm. Depth of focus figures, though, rest on some assumption about allowable sized of circles of confusion, and I'd like to do some empirical tests. Do you have any advice as to the best way to do this? Photographing a ruler at a 45* angle? (Although I don't know of a ruler with fine enough gradations. On my scanning rig, my D200 is mounted on a Velmex 20tpi linear slide. There's a lot of confusion surrounding those figures. It turns out that the "depth of focus" numbers listed by Edmund and Mitutoyo do not rest on any assumption about circles of confusion. Rather, they are based solely on wavefront error and thus represent what would be MTF effects as seen by a perfect analog sensor. In addition, their numbers reflect maximum deviation from perfect focus, so they give what we might call "single-sided DOF" rather than the "total DOF" that is given by classical formulas in photography. My recommendation is to shoot one or more focus stacks of a finely textured subject, somewhat inclined to the lens, then run the images through focus stacking software and look for focus banding in the results. An example at high magnification is shown HERE and in the surrounding thread. Another illustration of the same concept at much lower magnification is given HERE. The appropriate angle of inclination depends on what magnification you are using. It must be shallow at high magnification as shown in the first link, but can be quite steep at low magnification as shown in the second. In both cases, the goal is to get the focus bands just wide enough in the composite image that fuzzy gaps can be easily detected if present. Thanks, Rik. Does that mean that doubling the figures gives a perfect world type of standard? at 1:1 magnification and an f-stop setting on the lens of F4, the depth of field is 0.48mm. At F5.6, it's 0.67mm, and at F8, it's 0.96mm. All of this assumes a maximum circle of confusion of 0.03mm (0.012 in.). That seems a little loose. Some suggest that for an APS-c camera that a better coc is 0.019mm. Using the stricter coc in the DOF formula gives a DOF of 0.43mm at f5.6 on the lens. That's correct. You can cross-check by comparing against the calculator at http://www.microscopyu.com/tutorials/java/depthoffield/index.html. With the e-slider pushed full left (e=4), the number computed by microscopyu will be a little more than double the number listed by Edmund/Mitutoyo. It would be exactly double if you could set e=0 corresponding to the perfect-world assumption. Thanks Folks. I appreciate the help! λ=0.55µm is used as the reference wavelength. The number computed by Mitutoyo is the deviation from perfect focus required to produce the blue line at 1/4 wave error. Under this condition, the most-affected spatial frequency has its contrast cut to about 80% of what it would be at perfect focus. It should be apparent that this choice is somewhat arbitrary. Smaller defocus will result in less loss of contrast, and larger defocus will result in more. However, the loss of MTF increases steeply with wave error. 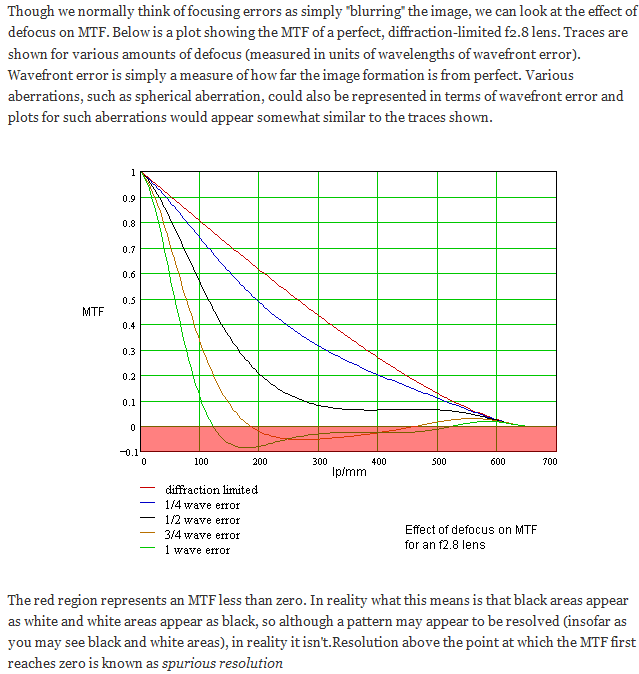 At 1/2 wave error there is severe blurring, with the MTF at some frequencies being cut to around 25% of perfect focus. At 3/4 wave error, the MTF curve has actually dropped below zero and some features may either disappear entirely or develop inverted contrast. So if you're going to pick one value for DOF, the value for 1/4 wave error is better than most. Again, note this is a one-sided number -- the total front-to-back DOF is twice as big. BTW, it's an amusing exercise to point a camera at a fine grid, turn the focus knob, and watch the black and white lines first blur and then swap places as the contrast inverts. But that's a topic for another day. Rik, thank you for the clear explanation!